At The Kerry cake Company each cake is custom designed to reflect personal preferences and style, making each cake uniquely its own. Our prices reflect the personal service and premium finish we offer to each of our clients. Approximate servings are 1″ x 1″ x 4″. Please note: Prices are a guide only as all cakes are quoted for on an individual basis and actual price depends on design complexity. Your choice of cake depth may also depend on your design. Layered sponge Cake, covered in chocolate ganache with a final layer of marshmallow fondant. These are sharp edged cakes, finished to perfection for a clean, modern look. Fondant ruffles, sugar flowers, stencilling are priced accordingly. Finished in a variety of textures including smooth, vintage or lined. These cakes can also be ‘naked’ or ‘Semi naked’ to show the cakes’ layers. Delivery to your chosen venue plus set up & decorating of your wedding cake on the morning of your wedding. You are most welcome to collect your cake by arranged appointment, however I cannot accept liability for any damage caused to your cake once it has left my premises. Free delivery is not applicable to 1 tier cakes. 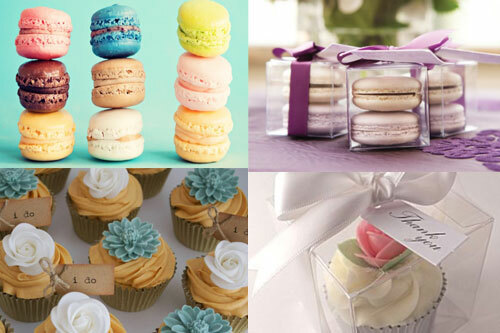 Wedding Favours / Dessert Table Treats. Macarons from €75 per batch 25. Macarons can be hand painted with flowers, initials, love hearts etc in collaboration with Izzy&Jules making these unique to your day, additional charges apply. Mini cupcakes from €45 per batch 30. Large cupcakes from €30 per 12 batch. Cake pops from €2.50 each. Chocolate truffle brownies from €3.00 each. Mini Pecan Pies €1.50 each. Lemon & Coconut squares €2.50 each. Mini Lemon & Blueberry Tarts €1.50 each. HoneyVanilla slice with homemade crumbled honeycomb in puff pastry €2 each. Guinness & Chocolate brownies €2.50 each. All of the above can be individually packaged & wrapped with a ribbon colour for your choice for an additional charge. A deposit of €150 will secure your date/order. Please note deposits are non refundable. These take place every 2 months. On the day I will have display cakes, 6 cake samples (of your choosing), along with a fresh cup of coffee or tea. We will discuss colours, themes, set up and much more. These consultations cost €30 per couple, which is deducted off the price of your cake, should you book your wedding cake. We will be showcasing our cakes, with samples, at wedding fairs throughout the year.